There are some great Rosegarden tutorials on the Internet and even some specifically dedicated to making sound using Rosegarden, e.g. this sourceforge tutorial. However, it took me quite some time to discover how to do it easily, on FC7, so here are some short easy notes that are up to date, keep doing out of date, but do not require the user to understand all the complexities of Rosegarden, ALSA, Jack etc. I have also tried these instructions out on Fedora 8, and they work fine, but please note the reference to pulseaudio below. Apparently, these instructions work fine on Fedora 9 without any changes. If anyone would like to try them on Fedora 10, 11 and 12 then feed-back, please email me at dwlegg [at] gmail [dot] com. See the email at the bottom for how to make them work in Ubuntu Intrepid and Linux Mint 5. Of course, the simplest way of getting sound out of Rosegarden is just to export your composition to a MIDI file, then to use timidity++ (or another suitable MIDI synthesiser) to play it. This will start Rosegarden when you click on the new icon, wait 10 seconds and then start timidity. You can see timidity connecting to the jackd ports that rosegarden creates. After that you can load a rosegarden file and the sound will work. Make sure that in the rosegarden Edit->Preferences menu the sequencer status says 'MIDI OK, Audio OK'. Also make sure that 'Use Jack Transport' is ticked, and also the 2 boxes after 'Make default jack connections for', called 'audio outputs' and 'audio inputs'. That you're using Fedora Core 7 (FC7) or Fedora 8 with SELinux disabled. That you have an Internet connection so that you can use yum. 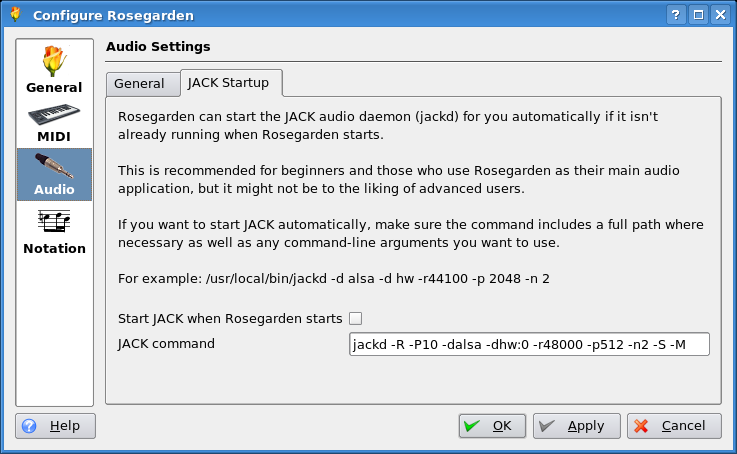 That you are using KDE V3.x, since Rosegarden is a KDE application. That you do not have a sound card that supports MIDI directly (because most of us don't). The installation of jack will put this stuff at the bottom of your /etc/security/limits.conf file, meaning that only users in the jackuser group can use Jack. After this, you *must* reboot your system for the security-related real-time sound changes to take affect. The tutorial that I referred to above suggests getting some sound fonts from here. Here are some settings for qjackctl and qsynth that seem to work for me using an AMD 64 3500 (64 bit) on FC7 with a kernel-2.6.23.8-34.fc7 kernel. I have noticed that feeble processors (<3GHz ish) with on-board sound do not make a good job of doing real-time sound synthesis using jack. You really need a fast processor or a decent sound card or both. 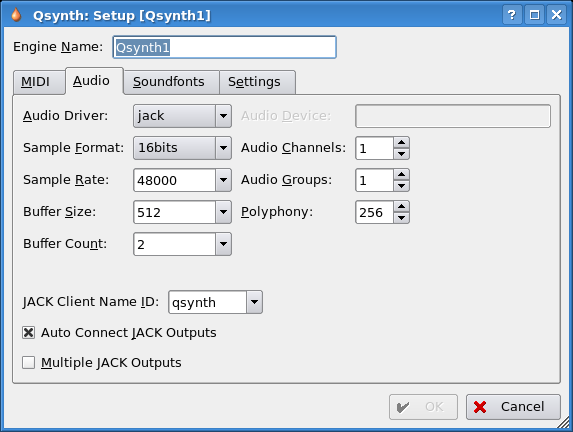 The important thing is to make qsynth and jack compatible with each other, or you will get no sound. 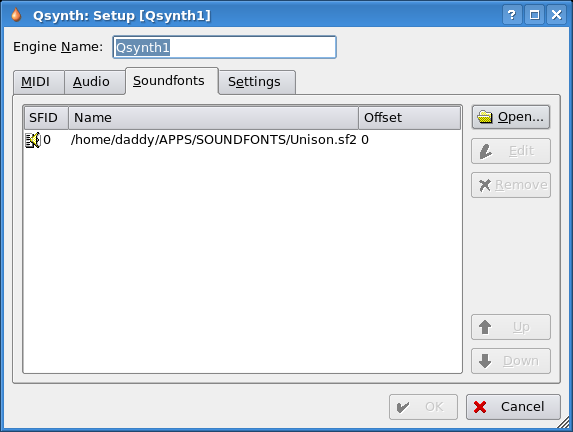 Start qjackctl and qsynth from the KDE menus in that order. 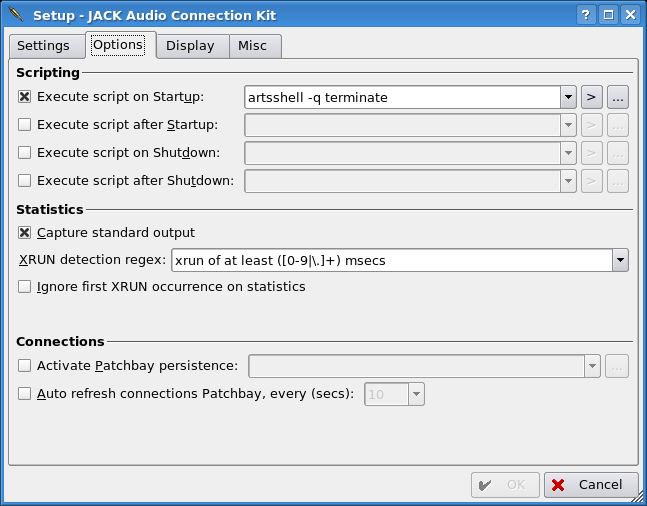 Also, and this is important, make sure that the 'Start JACK audio server on application startup' box is ticked under the Misc tab in the qjackctl setup. The entries 'Force 16bit' and SampleRate=48000 particularly need to match in qjackctl and qsynth. Others may require some experimentation to get your sound sounding good. The entry, Interface=hw:0, will often make the difference between sound and nosound. 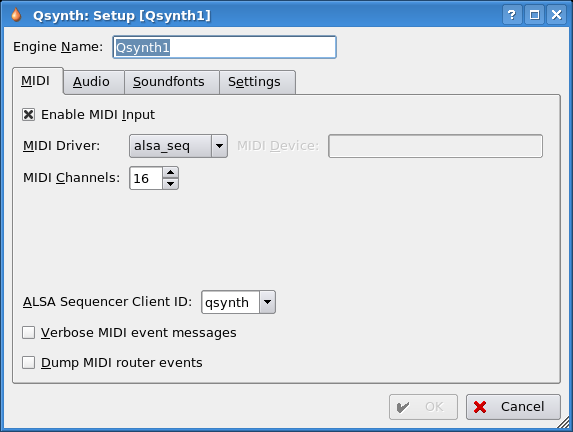 Remember to enable MIDI input in qsynth. That's what it's for :). 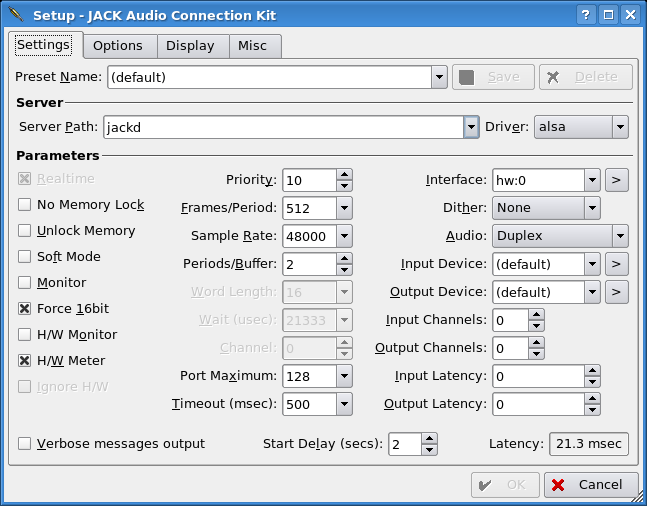 The entry 'Auto-connect Jack Outputs' will enable you to start jack, Rosegarden and qsynth such that all the connections via jackd get made automatically. This saves a lot of hassle. Tell Rosegarden to use the Jack transport. No need to tell Rosegarden to start jack, as we will see in a minute. N.B. that the Jack Command is not needed if this guide is followed fully. # Kill qjackctl, jackd and qsynth when rosegarden exits. Remember to chmod 755 the script and to reference it from a KDE icon so that you can start Rosegarden and its friends together. Please send any improvements to this guide to dwlegg a t gmail d o t com. with the following minor changes. a 2 second sleep between Qsynth and Rosegarden.